WHY?????!!!!!!! Why must it come to an end??????????!!!!!! I've really enjoyed this run on Moon Knight by the entire creative team. I'm gonna check out the first few issues done by the next team working on this title, but from what I read of the preview in the back of issue #6, I don't have very high hopes for it being an entertaining read that'll hold my attention. In this issue of Moon Knight there's a cop who loses his marbles. He absolutely becomes cuckoo for cocoa puffs, cuckoo for Moon Knight, cuckoo for Black Spectre. This cop is on the scene of an investigation, disgusted by the freedom by which Moon Knight is given to take over the case they are part of and handle it all alone. Moon Knight is given information and liberties and it seems so unfair to this guy. This guy feels like the best thing to do is to get rid of Moon Knight and take his place. He actually takes on the persona and guise of a villain named Black Spectre who was like the opposite of Moon Knight. When it comes to the final confrontation between the two of these guys, though, Moon Knight clearly points out how far short the cop's imitation of the crook falls. The guy isn't a great good guy (he doesn't seem like some outstanding role model) and he isn't a great bad guy (as seen in his failure to incur the least bit of damage to Moon Knight). The story is dark and entertaining. There are hardly any glimpses into Moon Knight's character, leaving Moon Knight as intriguing and mysterious. It's always just enough information given to tell each particular story which then allows the reader's imagination to surmise what they will about the sum of them for themselves. There's good pacing to the stories. The art is so cool, too. Sometimes it's nice to take a break from reading stories with long arcs because they become too complicated, are hard to keep track of, stall on character development, etc. 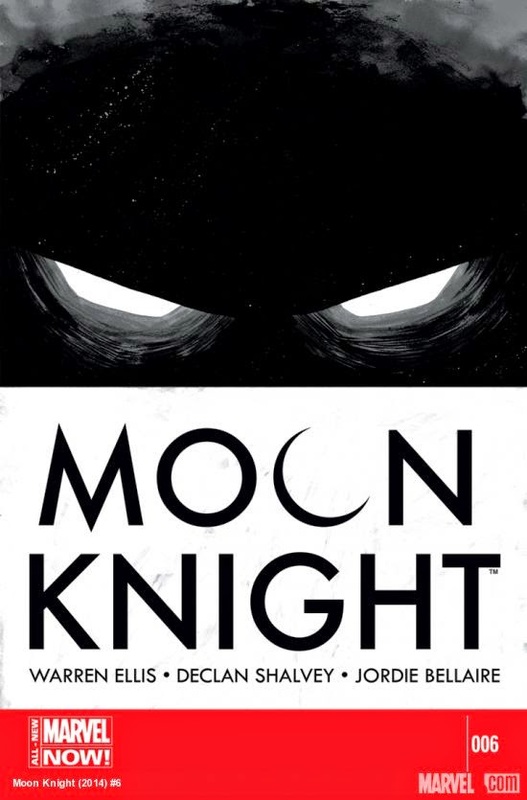 With this run on Moon Knight it's just been simple, good stories. Moon Knight is a focal point in them, but they have also been a lot about the other characters in them. It's another reason why I like the stories. The stories aren't self-absorbed tales revolving around Moon Knight's ego. I like this issue and this run a lot.